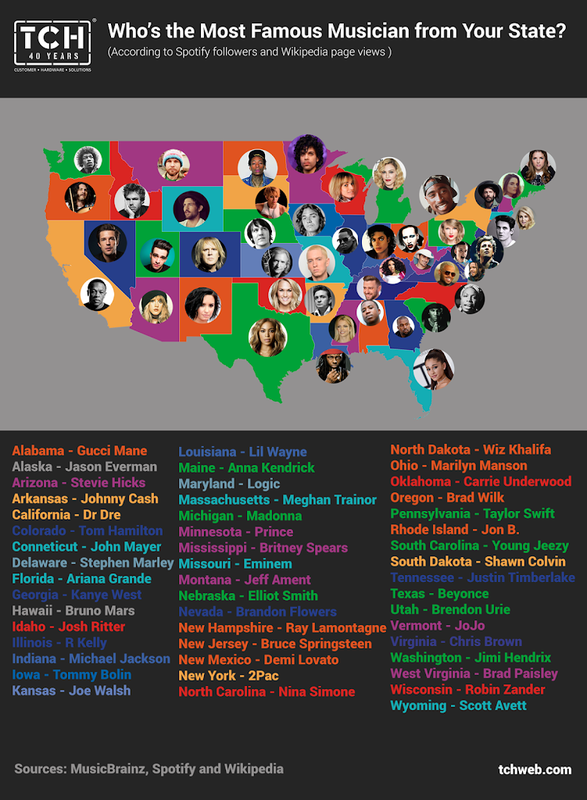 Who’s the most famous musician from your state? Do you know which famous artists were born in your home state or even who’s the most famous of the artists born there? Iconic artists hail from all over. From small towns to the Big Apple, chances aren’t that slim that you grew up a stone’s throw from a household name. PrettyFamous ranked artists by popularity and then by the state they were born in using their own measurement called “Musician Score.” They came up with this figure using Spotify followers, Wikipedia views over the past 30 days including page views of the musician’s band and releases. Notable artists that made it to the top of their respective states are Seattle native, Jimi Hendrix and North Carolina-born Nina Simone who were among quite a few of the artists that made the most popular list but are no longer alive. New rapper on the block, Logic (Maryland) and reggae artist son of reggae icon Bob Marley, Stephen (Delaware) were a bit unexpected to see but refreshing names nonetheless that popped up in the data.